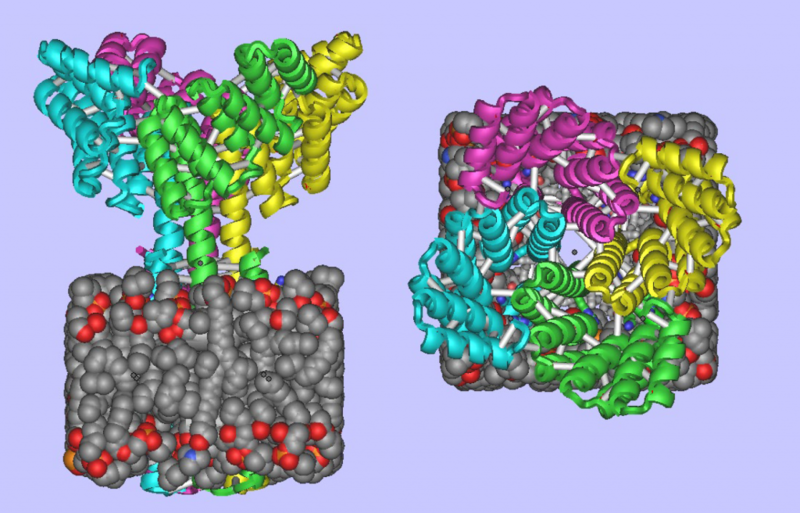 Designed Membrane Protein: (Left) Side view showing the designed membrane protein inside the membrane. (Right) Top view of same. The computational design of transmembrane proteins with more than one membrane-spanning region remains a major challenge. We report the design of transmembrane monomers, homodimers, trimers, and tetramers with 76 to 215 residue subunits containing two to four membrane-spanning regions and up to 860 total residues that adopt the target oligomerization state in detergent solution. The designed proteins localize to the plasma membrane in bacteria and in mammalian cells, and magnetic tweezer unfolding experiments in the membrane indicate that they are very stable. Crystal structures of the designed dimer and tetramer—a rocket-shaped structure with a wide cytoplasmic base that funnels into eight transmembrane helices—are very close to the design models. Our results pave the way for the design of multispan membrane proteins with new functions.